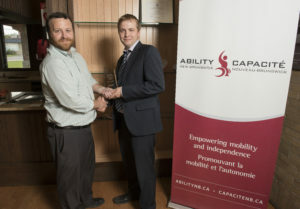 Left to right: Bill Leonard, Ability NB President, & Alex Green. PSAV – Our Caring Corporate Partner Award is presented annually to a business that has made outstanding financial and/or in-kind, including volunteer, contributions to our organization. The recipient of our 2014-2015 Caring Corporate Partner Awards is PSAV. PSAV is a leading provider of audiovisual services in Fredericton that is dedicated to creating memorable experiences and helping people share ideas to inspire change. Ability NB has partnered with PSAV for audiovisual support for our events such as Feast in the Field and our Hole-in-One Shootout golf tournament. Since 2007, PSAV has provided the audiovisual services for our band and Master of Ceremonies at Feast in the Field and has also provided three years of support to our organization for our previous golf event. Through event sponsorships valued at over $4,300 and over 150 hours of in-kind technical expertise, PSAV has helped Ability NB empower New Brunswickers living with a mobility disability. Thank you PSAV and Alex Green for being a true caring corporate partner.